Layers of glass pieces are seen missing from a chandelier (top), and Guru Gobind Singh’s dagger with jade handle in Quila Mubarak Museum in Patiala. What may come as a surprise that some precious artifacts or their parts have been disappearing from the museum in mysterious manner, but nobody seem to take the issue seriously. 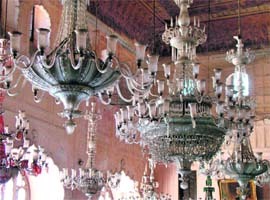 A visit to the museum situated in the ‘Durbar Hall’ of the fort that had served as an official residence of rulers of the erstwhile Patiala state upto the middle of 19th century, revealed that not only several layers of t of the chandeliers had gone missing, but also parts of some of these poorly preserved artifacts had got damaged. Similarly, parts of the silver royal chariot brought by the then Maharaja of Patiala to his state in 1909 from Calcutta were eluding the vehicle. According to sources, parts of chandeliers, chariot and other artifacts, not only at the museum but also at other department-run buildings housing heritage treasures, were being plundered in a slow but well-planned manner so as to circumvent scope of any doubt. Involvement of care-taking staff cannot be ruled out. Lack of awareness has been keeping the heritage treasure away from the public view. 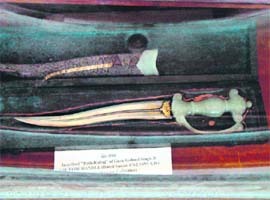 There were so many priceless artifacts, arms and armours, including camel guns and the famous ‘Kare Khan’ gun that was taken by Maharaja Ranjit Singh from Maharaja Sahib Singh in 1806 when the former had come to Patiala to settle a dispute between the latter and his wife. The gun was used by the Maharaja in his future conquests and was later captured by the Britishers in the Anglo-Sikh wars. Another interesting part of the museum collection is a dagger of Guru Gobind Singh embellished with a jade handle. The handle, they say, had a unique quality that it could change its colour if dipped in poison and worked as a great instrument to detect any poisonous substance in food.